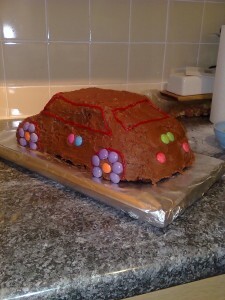 So Fecklet wanted a car theme for his birthday party. 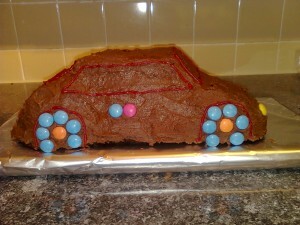 And I figured I’d make him a car cake. As they’re always saying on Top Gear (and I should know)—how hard could it be? I bought a car-shaped cake mould and some never-fail non-stick stuff. Followed the recipe, which said the cake would take about 50 minutes to cook. An hour and a half later, the cake was done, more or less. But it wouldn’t come out of the tin. I tried everything—gentle cooling, slight persuasion with a knife, tentative tapping. Finally I went with the Jeremy Clarkson approach: I hit the thing really really hard. And it came out. In pieces. Fortunately I had three things. Chocolate buttercream frosting. Smarties. And a large glass of wine. I think a four-year-old could tell what that was, don’t you? If he squinted? I mean, he habitually mistakes a pile of cushions for an aeroplane and keeps on telling me that I’m James May, so he might just fall for it. I should mention, by the way, that my mother is an AMAZING cake decorator. She has a barrage of icing tools, bags, nozzles etc and used to make wedding cakes and things. As a child, my birthday cakes were works of art, and there are photos to prove it. I was really proud of her. Fecklet, on the other hand, has me, so he gets the wonky clapped-out chocolate Mini glued together with frosting. It looks both gorgeous and delicious. And reminds me of the Dougal cake I had when I was three. Drown it in chocolate icing and no kid will ever argue about accuracy. I must admit I can’t wait to sink a knife into the thing tomorrow! I’m definitely going for the chocolate drowning theory. Do you take orders Julie – it looks delicious. I’m never doing this again, Sheila. Unless a year’s passing robs me of the memory. Kids are very credulous. Tell them it is a car and they will forever believe that it is a car. Trust me. I know of what I speak. I’m going to try to convince him it’s a Mini Cooper. It could be a new Mini or a Beetle. If only BMW or VW gave you the option of chocolate fudge icing and smarties… ahhh. It looks brilliant. He’ll love it! How long do you think a real Mini made out of chocolate would last? And when and how do you think we can find out? I think you’re very brave. I always bribed one of my friends to make cakes for mine when they were small and later on I worked for Asda so I got a discount. I may be brave, but you are smart. From someone who regularly forgets she’s cooking and thus spends most of her time on a stepladder screaming at the fire alarm to shut up I think you’re amazing! I think you SHOULD do it again next year!! Ah, yes, the considered Jezza hammer method. Nothing wrong with that. In fact, it’s usually the best way. And why are you James May? Is this meant to imply something about your hairstyle or topics of conversation? Or do you drive very slowly and cautiously? Nicolette, I have to thank you for being the only person to query why my son thinks I’m James May. I don’t think the resemblance is huge, but nobody else seems to have batted an eyelid. Fecklet still hasn’t seen the cake (I’ll show it to him after nursery) but if it passed the 7-year-old-with-temperature test, it will probably meet his stringent standards. 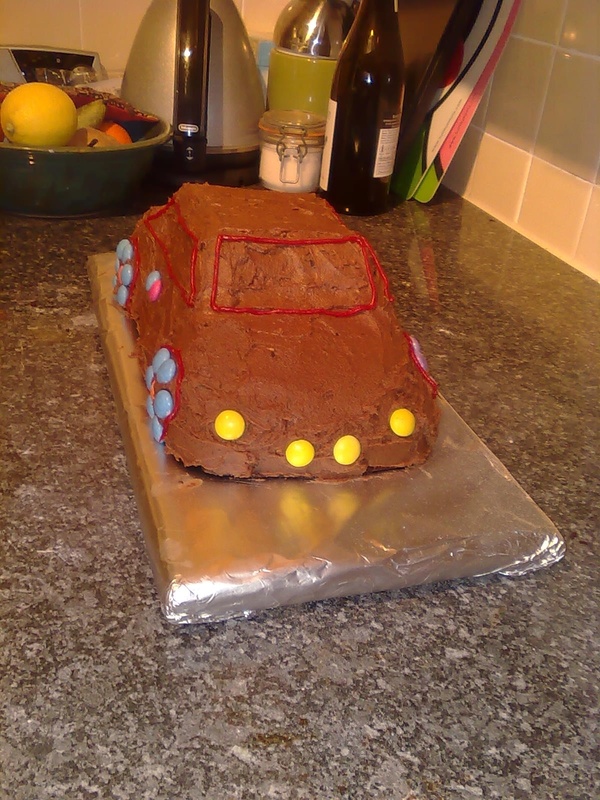 The Fecklet will love it…Cars choclate and homemade — what isn’t there to love? Love the cake. Is it lifesize for Richard Hammond? 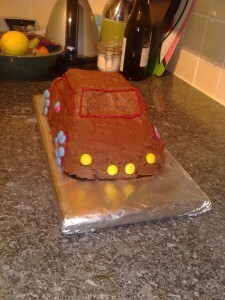 Remember that Skoda advert with the car made out of cake? How long do you think that would take to demolish? I bought a cake tin for my friend for Christmas, which says, “And on the eighth day, God created chocolate cake.” I fear the chocolate cake I’m making to go inside will be less than sainted, but I plan to cover it in Quality Street so hopefully she won’t notice. If I received a cake tin with a cake inside it for Christmas, I would be so monumentally chuffed. What a wonderful idea. Where did you get the tin? Julie, I bet he loved it. And 30 years later he’ll be telling his own children about how his mum spent so much time and love on him and bothered to make him the kind of cake he wanted. Ah well the truth is, he sees himself as Richard Hammond, and the Rock God and I fight it out between us to be James May, as neither wants to be Jeremy and for some reason we’re never allowed to be The Stig. The cake is quite wonderful. Looks just like my mini! Your mother would be very proud of you. I bet the little guy loved it. Maybe you could duplicate the design for when we celebrate his birthday here in the USA next week. It’s been a while since I made chocolate cake (whenever I make cake, I end up eating it ALL) so hopefully it will be at least edible, if not that pretty. But I was pretty chuffed with the idea, since said recipient friend is a huge fan of both chocolate and cake. I’ve also bought her some wine to go with it, so if the cake is crap she may not notice. It looks lovely. As much as I adore baking I’ve always been useless at this sort of thing and envy anyone who can do it. My son still loves Top Gear (aged 19) and would be delighted if I produced a car cake like this! 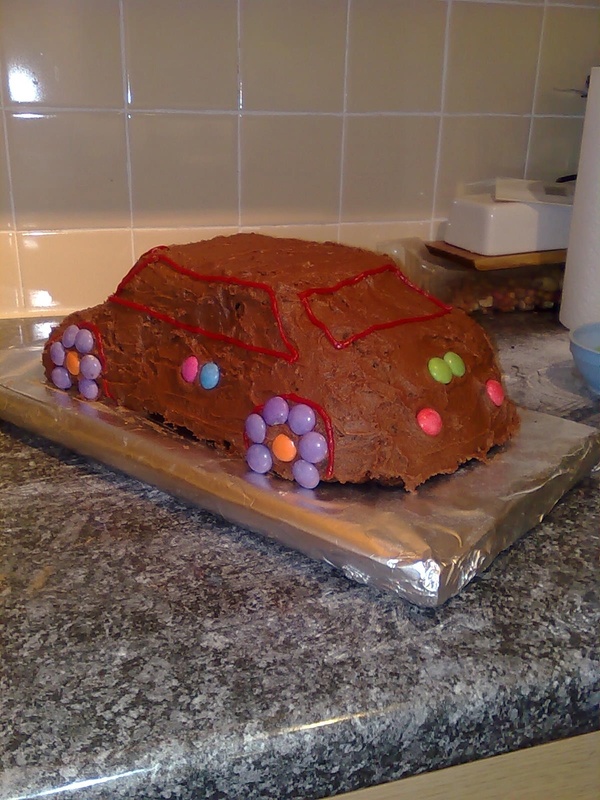 I think your car cake looks delicious and I have to admit being a tad envious of fecklet, since I’ve never had a birthday cake before, car-shaped or otherwise. Also, for future reference, look for something called Cake Release. It’s essentially popcorn butter, but it works wonders. Every time I make a cake, I’m tempted to drag out the old slip-n-slide, slather myself in Cake Release, and go WHEEEEE! down the hill.